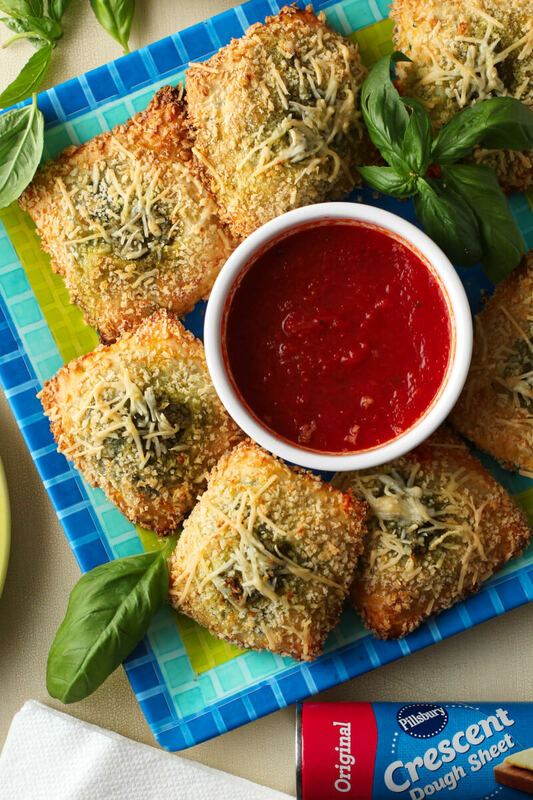 Toasted Spinach Pesto Ravioli, a category winner of the 48th Pillsbury Bake-Off® Contest, is a delicious appetizer recipe perfect for any occasion! Ah! It's here! I am super excited because I have finally had a chance to see some of the delicious recipes created by the Pillsbury Bake-Off® Contest contestants! I recently shared this year's Pillsbury Bake-Off® Contest in a blog post where I used Pillsbury Crescent Rolls to make my Brie, Bacon, and Apricot Jam Crescent Bites. They were so good! This year marks the 48th anniversary of the Pillsbury Bake-Off® Contest and, for foodies like you and me, this kind of event is a pretty big deal. The Pillsbury Bake-Off® is America's original cooking competition and always showcases so many amazing recipes. There is something very special about the history and tradition behind this Contest and I just love it! This year's category winners have officially been chosen and the grand prize winner of the Pillsbury Bake-Off® Contest will soon be announced on The Kitchen on Food Network. You can tune in on Saturday, February 24th at 11am ET/10am CT to see all of the category winners’ recipes and to find out who will win the grand prize! If you can't tune in, you can always visit the Pillsbury Bake-Off® Contest here to check out the winning recipes: Pillsbury Bake-Off® Contest. 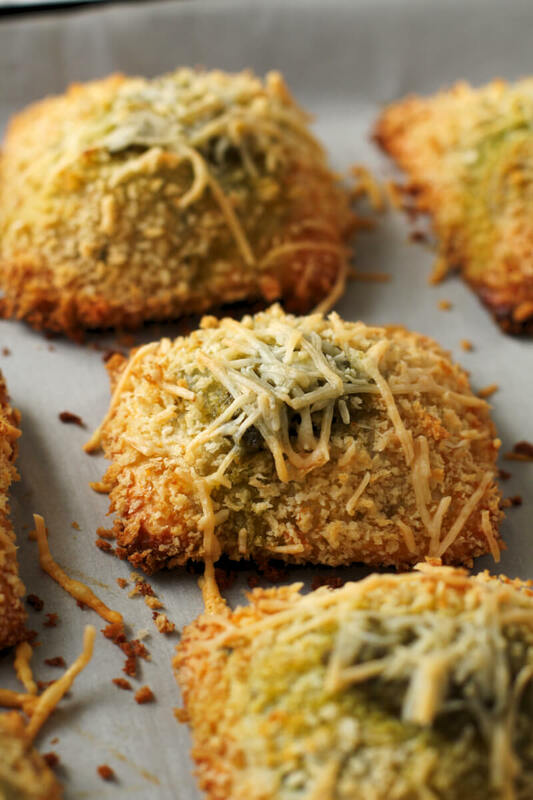 I love, love, love this recipe for Toasted Spinach Pesto Ravioli submitted to the Bake-Off® Contest by JoAnne Tucker of Tampa, FL. Her mouthwatering recipe is the winner of the Appetizers For Any Party category of the Contest. Appetizers are my favorite course of any meal and as soon as I saw this Toasted Ravioli, I knew I had to try it. 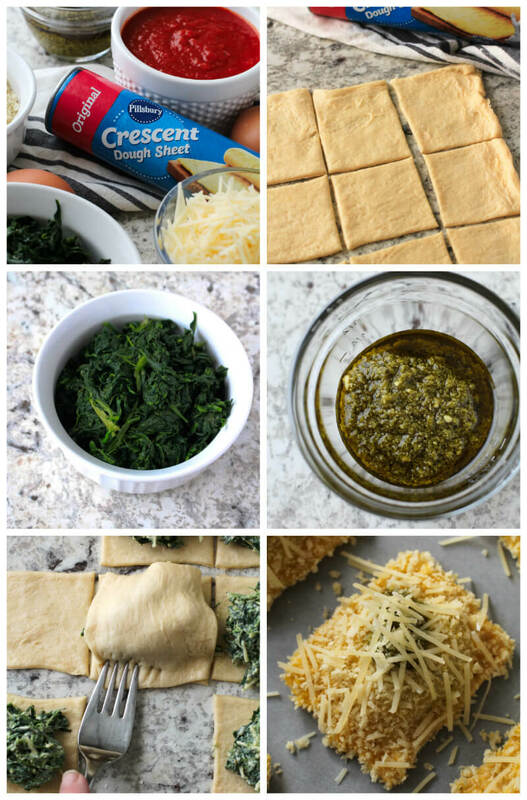 I thought that the use of crescent rolls in place of pasta dough was so creative! JoAnne and her family love any recipe that includes spinach, and her family's love of spinach inspired this tasty ravioli recipe. Entering the Pillsbury Bake-Off® Contest is a tradition for JoAnne's family and she knew that incorporating spinach into her entry to the Contest would be a great choice. She was right! 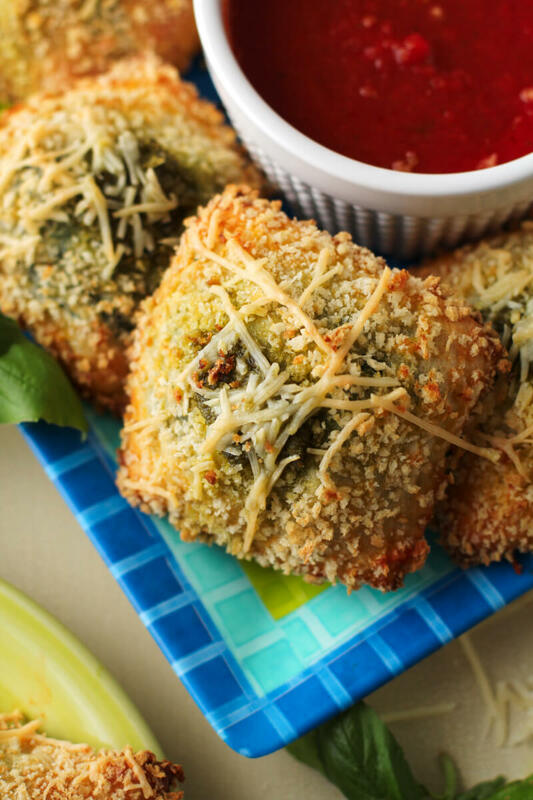 JoAnne used panko breadcrumbs for a delicious crunch and just the right amount of pesto sauce and parmesan cheese mixed with the spinach to bring amazing flavor to this winning recipe. JoAnne, along with the other category winners, has won a trip to New York! The Grand Prize winner will be announced on The Kitchen on Food Network and will win a kitchen makeover from GE Appliances and $50,000 in cash. I can't wait to see who will win! I know that all of the category winners' creations will be must-try recipes. Creating memories made at home in the kitchen is a big deal for my family and I look forward to seeing what they will think of this year's winners of America's favorite baking competition! You should give one (or all!) of them a try, too! I hope you love this recipe as much as I (and the folks at Pillsbury!) did! If you try it, I'd love to know what you think in the comments below. Enjoy! 1. Heat oven to 375°F. Line 2 large cookie sheets with cooking parchment paper, or spray with cooking spray. 2. Microwave spinach as directed on box. Drain well; squeeze dry with paper towels. 3. In a large bowl, beat spinach, cream cheese, 2 tablespoons of the pesto and 1 of the eggs with electric mixer on medium speed about 1 minute or until blended. Add 1/2 cup of the Parmesan cheese; beat on low speed about 1 minute or until blended. 4. Lightly sprinkle work surface with flour. 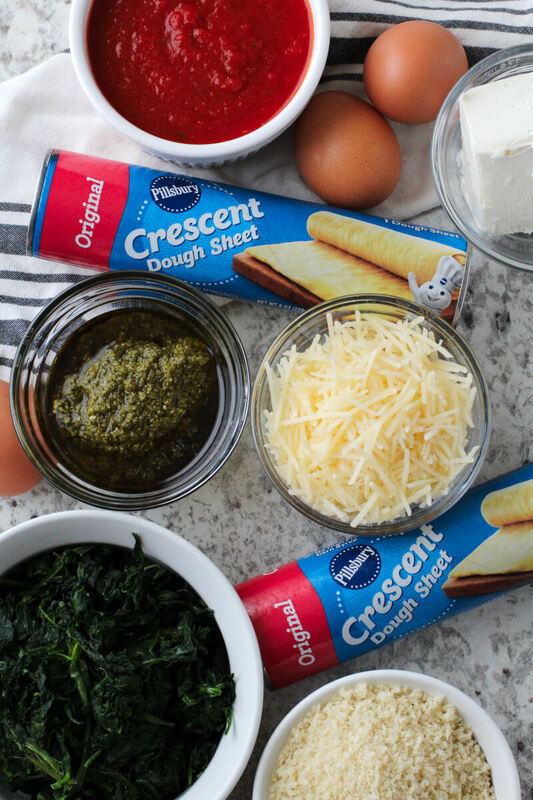 Unroll dough on surface; if using crescent dinner rolls, pinch seams to seal. Press or roll into 15x12-inch rectangle. Using a pizza cutter or sharp knife, cut rectangle into 5 rows by 4 rows to make 20 (3-inch) squares. Spoon heaping tablespoonfuls spinach mixture in centers of 10 squares. Top with remaining dough squares, stretching the dough to cover filling; press edges with a fork to seal. Place on 1 of the cookie sheets. For easier handling, refrigerate 15 minutes. 5. Meanwhile, in a medium bowl, beat remaining 2 eggs with whisk or fork. In a shallow bowl, add breadcrumbs. Set aside. 6. 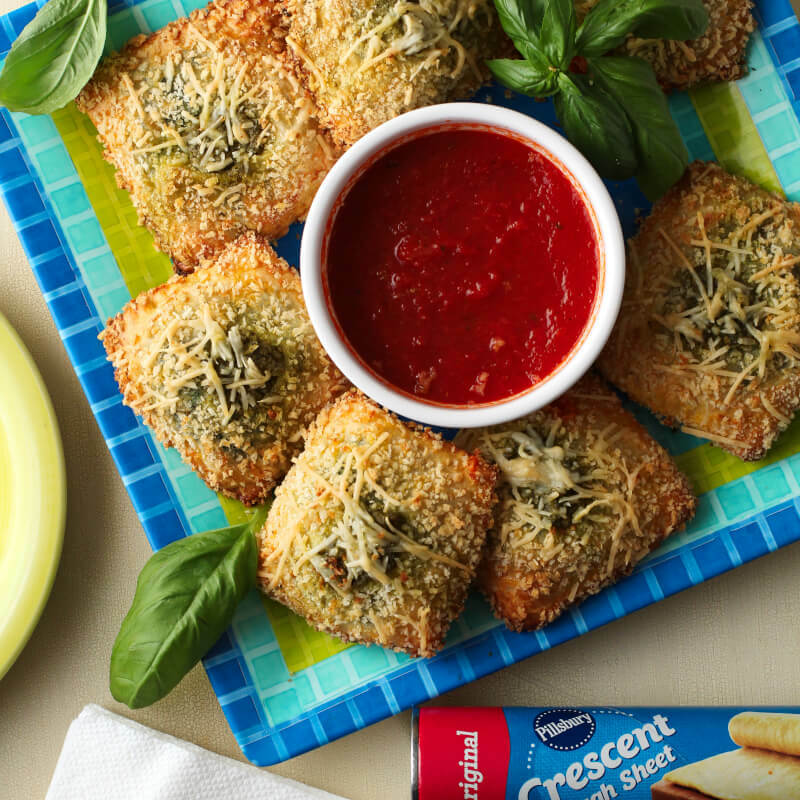 Dip each ravioli into the egg, allowing excess to drip off, then into bread crumbs, coating both sides of ravioli. Place ravioli 1 inch apart on second cookie sheet. Top each ravioli with about 1/2 teaspoon of the remaining pesto; sprinkle with remaining 1/4 cup Parmesan cheese. 7. Bake 16 to 18 minutes or until golden brown. 8. In a small microwavable bowl, cover and microwave marinara sauce 30 to 60 seconds on High or until warm. Serve ravioli with marinara sauce. I love anything pesto and this looks incredible. Love ravioli and the fact that you baked it sounds wonderful. Can't wait to try this. absolutely digging that texture on top. So many good things in one bite! I love that these are made fresh with pesto. It's just the best! 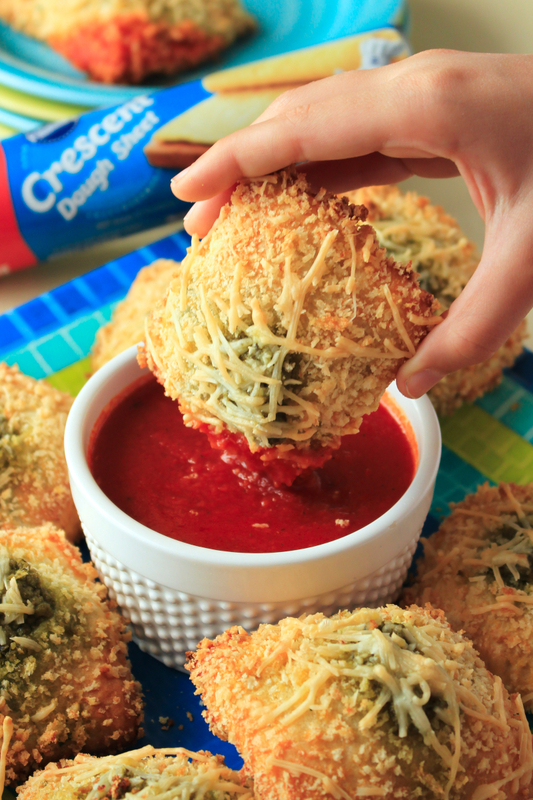 That crispy parmesan on the top looks wonderfully crunchy. Good for Joanne, these look fabulous! Lovely recipe! The Pillsbury Bake-Off always brings back fond memories of my mother who was in the contest twice! I know all the contestants work VERY hard to get in the competition and have to be super-creative! This is just a very creative recipe and I love how she created a ravioli with it. It looks so tasty. Whoa, this appetizer looks amazing! Thank you for sharing Joanne's recipe!